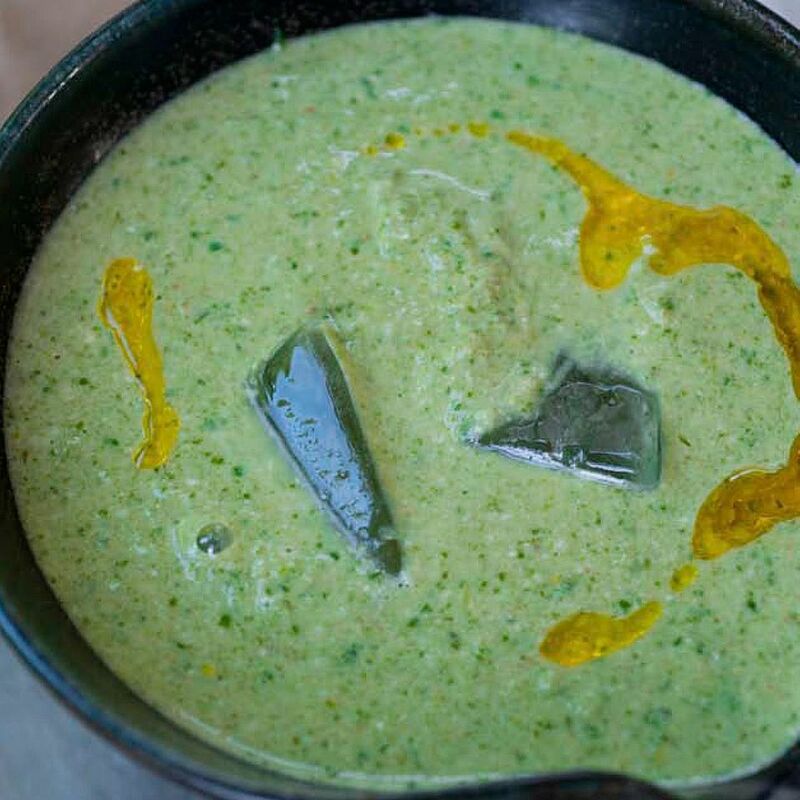 This Green Gazpacho recipe is from Ottolenghi's book, Plenty. As he states in the book, there are a million recipes for gazpacho, which he says is his favorite cold soup. This one, a green variation is loosely based on tarator, a cold yoghurt and cucumber soup from the Balkans. A freestanding blender works best but a stick blender could also be used. Start the dish by making the croutons. Preheat the oven to 375 F/190 C/Gas Mark 5. Cut the bread into 1"/2cm cubes and toss them with the oil and a bit of salt. Spread on a baking sheet and bake for about 10 minutes, or until the croutons turn golden and crisp. Remove from the oven and allow to cool down. Roughly chop up the celery, peppers, cucumbers, bread, chilli,​ and garlic. Place in a blender and add the sugar, walnuts, spinach, basil, parsley, vinegar, oil, yoghurt, most of the water, half the ice cubes, the salt and some white pepper. Blitz the soup until smooth. Add more water, if needed, to get your preferred consistency. Taste the soup and adjust the seasoning. Lastly, add the remaining ice and pulse once or twice, just to crush it a little. Serve at once, with the croutons.